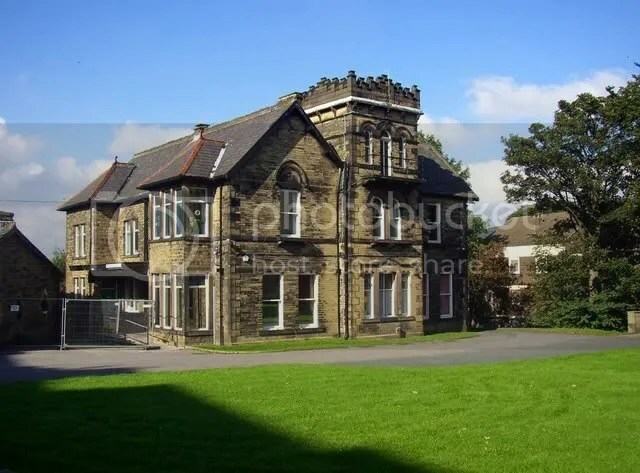 Standing in the uncommonly haunted locale of Elland’s Westgate, Ellen Royde is today utilised as an NHS clinic but for the majority of its history it was home to the Smithies family, a famed line of local worsted manufacturers. They built the house seen today in 1680 although there is speculation it may have been erected on the site of an earlier structure. The name is thought to derive from the elder trees (ellen being an old dialect word for the same) which once covered the land on which it was built. It is interesting to note that elders are rich in folkloric associations, especially with regard to faery activity. Either way, the house was once well known as the haunt of boggarts. There used to be a scooped out stone in the garden there, dubbed the Boggart Chair. Apparently it was in fact the sundered remains of a church font which had been deposited there by raiders or possibly during the English Civil Wars, but local tradition attributed the hollowed out facade to boggarts wearing away the stone as they sat there waiting to gain entry to the house. No particular record of their activity within the building survives, but doubtless they were intent on causing mischief as is a boggart’s wont. What is most curious about the story, however, is that an almost identically named building (Ellen Royd, missing the “e”) with an identical tale attached is to be found in the village of Midgley in the upper Calder valley. The similarities are such that is entirely certain that one borrowed the story from the other but it remains an open question not only as to which came first but whether the transposition occurred in the oral tradition or whether it was simply a journalist or local historian who confused the two sites in more recent years. U used to work there as a district nurse but don’t recall any spooky happenings–however, it was always full of mums and children and patients. I suspect the story was lifted wholesale by a local historian from the Midgley Ellen Royd, although whether on purpose or due to confusion, I’m not sure. Nonetheless, there certainly is a large lump of rock quite deliberately left in the middle of the lawn (sadly not visible on the photograph) for no apparent reason, which I assume is the stone referred to as the Boggart Chair. Do you recall it being there when you worked there? My family lived at Ellen Royde in the 1950s when it was a public library. Thanks for the comment, Ann. Do you by any chance recall if the “Boggart Chair” was there during the 1950s? It’s an incongruous stone boulder situated in the middle of the lawn for no apparent reason. I don’t remember the stone, but my sister, who is 2 years older than me does remember it. She says there was a bouder like an island in the middle of the lawn and we used to play on it as children. She thinks there was some earth on the top so that it was easy to climb up to it and sit or stand on the top. We lived at Ellen Royde for 3 years , until 1958 or 1959 when we moved to London. I was 8 when we left. We lived in the servant’s quarters, as our father was a gardener with the council, and our mother had to clean the library . I remember going into the library with Mum and getting a book from the children’s section and sitting on the big stairs, whilst Mum had to do the cleaning, which she hated having to do as she was a qualified nurse! Hence the move to London where Mum went back to more suitable employment and Dad got a better job with better prospects. I have very fond memories of living at Ellen Royde though! Unfortunately, Mum died in March, and Dad has been dead for nearly 6 years and they would both have known more about Ellen Royde than I am able to tell you. Thanks Ann, that’s extremely useful information. I intend to write something more detailed about Ellen Royde at some point in the future, so this first-hand input is invaluable. It is interesting to hear that the “boggart chair” was there in the 1950s. I’m still very much at a loss as to what function it ever served and how it comes to be so incongruously located on the lawn. The fact is, the Ellen Royd, Midgley house did indeed have a Boggart’s Chair in the garden. We lived there between 1983 and 1996, by which time the chair – apparently as said above, a slighted font – was in Luddenden Church (where is can doubtless still be seen.) And if you walk into the churchyard, oppposite the Lord Nelson pub where Branwell drank, look to the left of the gate, and you will see the tombstone of ‘William Oddy of Boggart House’. It only got renamed ‘Ellen Royd’, we think, once the tannery house (which it was) got gentrified. Funnily enough, we also found in the garden what may just be a bird bath, but we’re pretty sure was a holy water stoop. Was the Boggart’s chair & the stoop taken up to Boggart house for safe-keeping – or was Ellen Royd itself a site of ancient worship? Thanks for the information, Ian. I was aware of the font in Luddenden Church, although the holy water stoop/bird-bath is interesting. Local folklore claims the font was carried to Ellen Royd from the original medieval church at Luddenden by Roundheads during the English Civil War. It’s curious that the building was dubbed Boggart House prior to being called Ellen Royd. Given that the name means “land cleared from elder trees”, in Old English, you’d think this would’ve been its original name, unless it was borrowed from elsewhere. Which gives me a great deal to ponder on. My family lived at Ellen Royd from 1945 -1950 ,I was only about 7 yrs . when we moved there ,at that time the Food Office was also sited there as well as the library .The Food Office dispensed the ration books and baby milk powder ,and concentrated orange juice. There used to be a large rock in the lawn ,but also there was a fairly large tree by the rock as well. Down in the cellar there was a passage /tunnel that led fromthe house out in the direction of the lawn /Westgate ,it was all very scary at the time. Thanks for your informative comment, Peter. The large rock remains on the lawn (although the tree has since gone) and I presume is what people refer to as the Boggart Chair. It has clearly been deliberately preserved, but its original function is a mystery. Some metal embedded in one face may give a clue. I was not aware of the legends of secret tunnels running from there to the Fleece and St. Mary’s Church, so I’m very grateful to you for bringing them to my attention. If all the rumours of secret tunnels beneath Elland were true (including from Old Hall and even Fixby Hall), the town must’ve been a subterranean labyrinth! the large stone has now been removed from the lawn and ellen royd is undergoing a complete refurbishment, its going to be a a private nursery and the garden had a new play area built. i live across the road and watched its transformation its opening is coming soon. Yes, I know about the refurbishment, thanks Janice. The Boggart Stone has actually been moved to the gardens on Jepson Lane. where it was rather unceremoniously dumped, resulting in some damage. I should really update this entry when I have a moment.